“This multi-tasking night serum is a synergistic blend of treasured Indian herbs to nourish and restore a natural glow and youthfulness to tired, ageing and pigmented skin. Plant polyphenols, carotenoids and flavonoids present in these precious botanicals prevent and reverse free-radical and DNA damage and block the inflammatory changes that result during the skin ageing process. Indian Ginseng or Ashwagandha in this fast-absorbing, light-textured skin potion is a potent antioxidant and immune-modulator with anti-inflammatory properties. In synergy with other plant nutrients it helps boost collagen-synthesis, cell renewal & tissue repair thus diminishing fine lines, spots and signs of photo-ageing. *Free from petrochemicals, parabens, SLS/SLES PEG/PPG, Genetically modified ingredients(GMO) and other synthetic ingredients. Certified organic aloevera juice, certified organic veg. glycerine, potassium sorbate, soy lecithin, sodium benzoate, natural preservative blend of herbs and essential oils. Comes in a dark glass bottle with a dropper. Since, it’s not facial oil but a thicker face serum, the dropper bottle makes it very inconvenient to take out right amount of product for single use. A small pump bottle would have better served the purpose here. It has a very light slightly yellow, slightly brown runny texture that sinks in quickly and gets absorbed easily by the skin. Since, the serum is water-based and neither oil, nor cream based, it hydrates wonderfully without any break-outs, greasy residue or stickiness. While, the brand claims this facial serum to be fragrance free, I dig and dig and can detect mild herbaceous medicinal scent that evaporates quickly once you apply the product on the skin. I had just finished my night cream and was already on the look-out for a good night serum, when I first received this serum in my Sep 2015 Fab bag. So naturally, my first instinct towards this serum was to use it as a night serum. However, I didn’t notice any difference (read morning radiance I get from my favorite Kaya night cream) to my skin the morning after using this serum as a night time facial serum. But after reading all the rave reviews and impressive ingredient list I was adamant on using this serum anyhow. So next day, I used it as a morning moisture serum under my regular sunscreen and was totally blown away with the results! It shrunk my pores, reduced oiliness and kept my skin looking fresh and hydrated all day long! No wonder, I started using this beauty elixir facial serum extensively as a day-time moisture serum under my sunscreen and as a staple primer under makeup. Even though, the beauty elixir serum by Just Herbs did not perform well for my night time beauty regimen, it worked wonders for my day time skin care. And as I started using it as my regular day moisture serum, I noticed the results kept getting better with continued use. Overtime, using this anti aging facial serum my skin looked much smoother and clearer without any occasional acne break-outs or spots. I liked the way my skin felt nourished and hydrated with a supple glow. But talking about the claims for correcting pigmentation and fading fine lines, I regret to say, the serum couldn’t do much in that department. So based upon my personal experience of using Just Herbs rejuvenating beauty elixir serum, I just found the serum to be a good day-time moisturizer and nourisher for oily skin but anything beyond that the serum was found to be lacking. And because I only wanted a quick absorbing, non-oily moisturizer for my oily to combination skin, I found Just Herbs beauty elixir serum to be an icing on cake with all its appealing plant based extracts and anti-oxidants. It not only layers extremely well beneath my makeup and spf but also shrinks pores while moisturizing and nourishing the skin. The only cons of this product are its packaging and pricing, which as of now are preventing me to buy this product again from my own pocket. 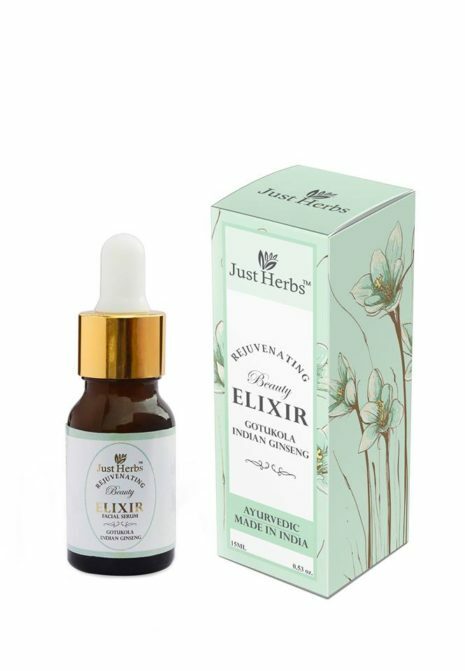 All in all, I found Just herbs rejuvenating beauty elixir serum works better as a day time moisturizer for oily skin, which not only hydrates but nourishes and primes the skin as well. Skin looks fresh, supple, and hydrated while using this serum. However, for the price it comes, I feel there are many other less pricey but equally good options in the market. Take for example, Aviance moisture serum, which comes in double quantity for almost same price and provides the similar benefits for the skin. But do give this facial serum a try, if you have sensitive, oily or combination skin and like your beauty products to be free from any chemicals. Nice post… It was really informative. The serum is an amazing product for skin. I have been using “Annimateo” Total Renew & Reshape Anti-aging Serum. its Carefully applies 3-4 drops on clean face and neck. Leave absorb into the skin. Your skin will feel instantly hydrated. If you wish, apply your regular face cream over.Thank you for sharing.